Always a hit with the family, our Marinated Loin Ribs are oven-baked to mouthwatering perfection and complemented by a crisp green salad and crunchy pumpkin chips! Place the ribs on an oven sheet and cook for 25 to 35 minutes. Arrange the baby spinach, basil and rocket on a serving platter. In a bowl, coat the baby marrows with the olive oil and the lemon zest and juice. Add the marinated marrows to the rest of the salad and season with salt and pepper. Place a pot of oil on high heat and deep-fry the pumpkin slices until golden and crisp. Remove the pumpkin from the oil and season with the sage and salt and pepper. 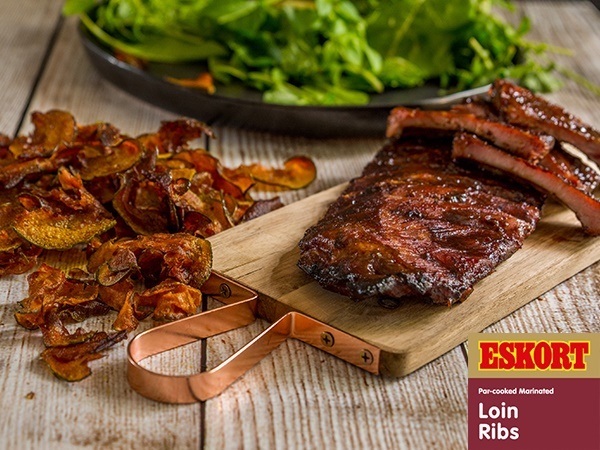 Slice a portion of the ribs off the rack and serve alongside a helping of the salad and some pumpkin chips.